Home /Get me out of Australia? Get me out of Australia? Investors’ desire for growth outside of the suffering Australian economy was a major theme to emerge in the February 2019 Reporting Season, particularly in the small-to-mid-cap segment of the market. Since around September 2018, economic data in Australia has weakened, largely due to the flow-on effect of falling house prices on consumers. Key data points such as retail sales, business confidence and consumer sentiment have all weakened as a result. The downward trend in business confidence has continued with the February 2019 NAB Business Survey confirming that business conditions decreased to the lowest levels since 2013. 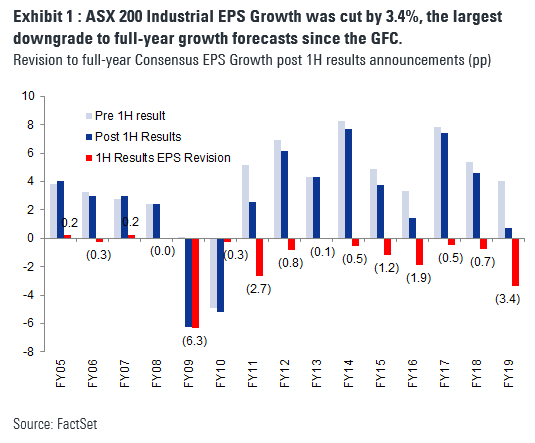 As shown below, Consensus Earnings per Share growth forecasts were cut after the Reporting Season results by more than anytime since the GFC. In addition to retail, the weakening economic data has impacted automotive, media and building materials contributing to the recent February reporting season is the weakest since the global financial crisis. According to Goldman Sachs’ strategy team, housing-related cyclical companies have underperformed their industrial peers within the S&P/ASX200 by more than 80% over the last five years. Domestic cyclical companies such as Costa Group (ASX:CGC), Boral (ASX:BLD) and Bingo (ASX:BIN) disappointed expectations prior to the February reporting season, with these companies highlighting patchy demand over the December quarter. With investors shying away from domestically-exposed cyclical companies, the divergence between value and growth companies has never been greater, with Goldman Sachs showing that the differential between value and growth is now at highs not seen since the ‘tech bubble’ in the early 2000s. According to Goldman Sachs, the bucket of ‘high price-to-earnings’ firms or growth companies are trading at a 70% premium to the market’s valuation which is 21% above the long-term average. On our estimates, sectors exposed to the domestic economy represent approximately 31% of the S&P/ASX Small Industrials Index. Given the uncertainty associated with these sectors at present, investors have been looking for growth companies offering greater certainty to earnings, which has driven up valuations as a result. With consensus now assuming that the RBA may cut the cash rate in the second half of the year, expectations are for the Australian dollar to continue to decline. This expectation has driven companies with strong offshore franchises, to outperform strongly. Which companies are still doing well? Companies such as IPH Limited (ASX:IPH), Breville (ASX:BRG), Lovisa (ASX:LOV), Appen (ASX:APX) and Altium (ASX:ALU) reported solid results and have seen their valuations increase to all-time highs. Following the lead of the FAANG (Facebook (NASDAQ:FB), Amazon (NASDAQ:AMZN), Apple (NASDAQ:AAPL), Netflix (NASDAQ:NFLX), Google (NASDAQ:GOOGL)) stocks in the US, the Australian technology sector (what we call the WAAAX sector: Wisetech (ASX:WTC), Afterpay (ASX:APT), Altium (ASX:ALU), Appen (ASX:APX) and Xero (ASX:XRO)) has seen valuations increase to extraordinary levels with the average 12 months forward price to earnings multiple for these four companies a whopping 70x (excluding APT which is loss making) compared to the ASX Small Industrials Index which currently trades on 19x. Oscar Oberg is a Lead Portfolio Manager with Wilson Asset Management. We have an extensive library of videos and information available for you. Fitzpatricks advisers include some of Australia’s most experienced and qualified professionals. Located across Australia and available for a no obligation initial meeting to discuss your life goals and aspirations. Visit our library of resources containing educational articles and videos to help you live a great life and to keep you updated on financial matters. 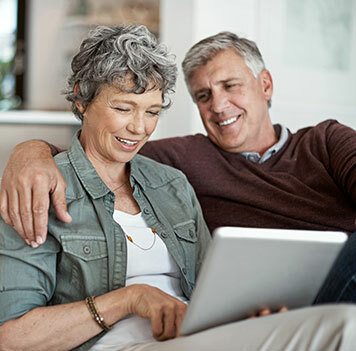 Our Private Wealth Program gives you a financial road map, including action plan to achieve your three and 10 year goals. This information is not personal advice and you should not act on it unless you have received personal advice from a licensed adviser. Please read our Important Information.